I have no idea who this person is but Moshe spotted this car parked near the Apple campus. 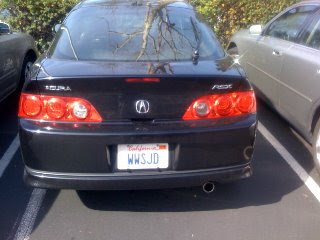 For the record, if you’re really wondering WWSJD, well, for one thing, SJ wouldn’t put this plate on his car. Or any plate for that matter. But I do appreciate the little tribute. Honestly. Stuff like this just makes me tingle. » Scoble has a man crush on me. And I’ve got one on him. Scary!